The normal human heart is a hollow muscular organ that receives blood from the veins and pumps it into the arteries. The heart of an average adult beats more than 100,000 times per day - a child's heart even more. 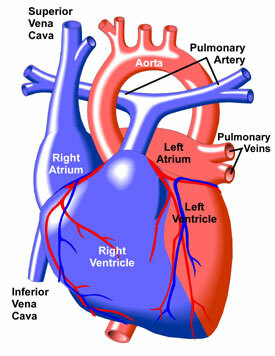 The heart is divided by muscular walls into right and left halves, each of which is subdivided into two chambers. The upper chambers, or atria (singular atrium), receive blood and pass it on to the lower chambers, or ventricles, which pump it out of the heart to the lungs (through the pulmonary artery) and body tissues (through the aorta).